The bike includes a U-brake with soft clear anti-scuff pads that will allow you to tackle any obstacle knowing that the rear brake is always going to be there whenever you need it. The massive 2.4" lagos crawler tyres were designed to carve really clean and absorb heavy impact so you can ride as fast as you want without compromising your grip. The model has no pegs. 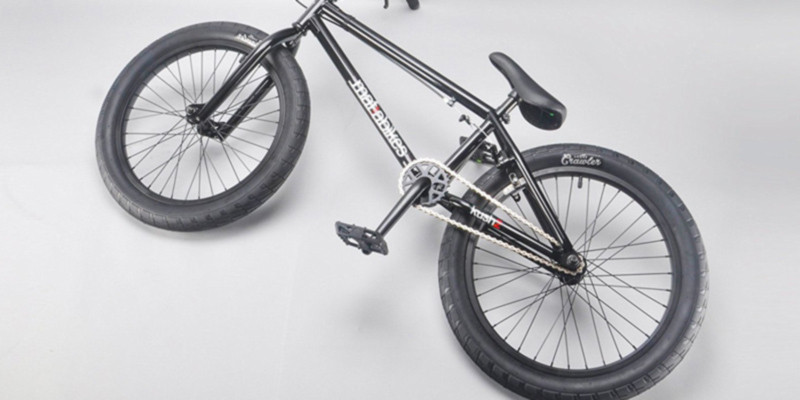 Though the Mafiabikes Kush 2 20" is still technically an entry-level model, given the kind of specifications it comes fitted with, the product could definitely be described as one of the best BMX bikes for experienced enthusiasts looking for an affordable yet reliable freestyle option. The new and reduced fork clearance will prove to be immensely helpful in terms of pulling off easier foot jams, an angled seat clamp is comfortable enough for you to perform some of the craziest stunts you can think of, and the micro dropouts are there in order to achieve that super clean-looking back end. You can only use the model for off-road racing or enclosed tracks. The Rocker BMX iROK+ MINI MAIN Rocker is definitely not a bike for everybody, but if you're the kind of person that always looks for new experiences and unique solutions to orthodox grinding problems, this is a model worth looking for. An electric blue, black, and white-themed frame effortlessly stands out in a crowd, making sure that everyone sees what you're capable of. An exceptional rotor system will allow you to keep your cables untangled. Thanks to this system, along with 20-inch black alloy rims with large flange steel hubs, spinning your handlebar around 360 degrees has never been easier. Takes some time to assemble the whole thing together. If you feel like an incredibly daring and stylish BMX bike that'll allow you to perform some of the sickest possible stunts would be right up your alley, you should definitely consider looking towards the Flite FL020. The model incorporates a top load stem that lends it more strength and gives the bike a better ride. On top of that, a padded PVC seat will provide just enough comfort to successfully pull of some of the coolest tricks. The bike comes equipped with 10" steel wheels and 10" heavy duty, high impact, chunky, rubber tyres, so no terrain will be able to throw your rider off his game. The bike doesn't have any brakes. 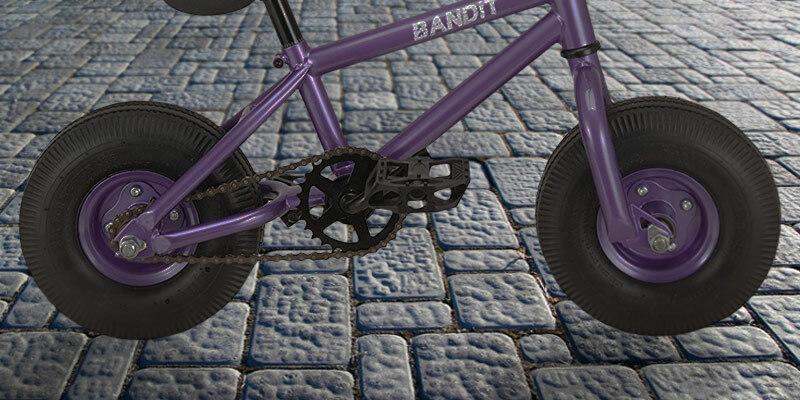 The RayGar 2017 Bandit Purple Mini is something that you simply cannot afford to miss if your kid is ready to challenge some pipes or handrails and all he needs is a reliable vehicle that can handle a substantial amount of abuse. The frame is a BMX style that includes pivots for V-brakes. The brakes are located around each of the wheels using an adjustable two-finger system in order to secure the safety of the rider. 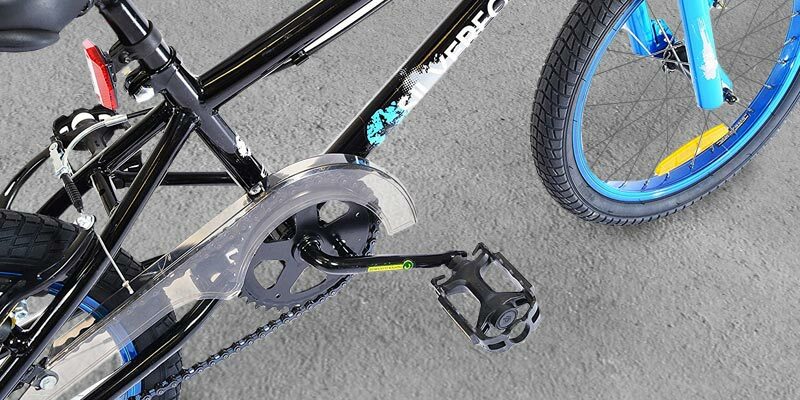 The bottom bracket is a one-piece BMX type as well, so your crankset will be able to rotate freely without stiffening your movements. The instructions are somewhat unclear. Thanks to the comfortable frame and a high-quality handlebar, this unisex BMX from SilverFox will be a perfect choice for beginners that want to explore the world of tricks, stunts, and BMX racing but don't quite know where to start. It should go without saying that BMX bikes are inherently cool and anyone riding them is never going to trail behind in terms of popularity and respect. 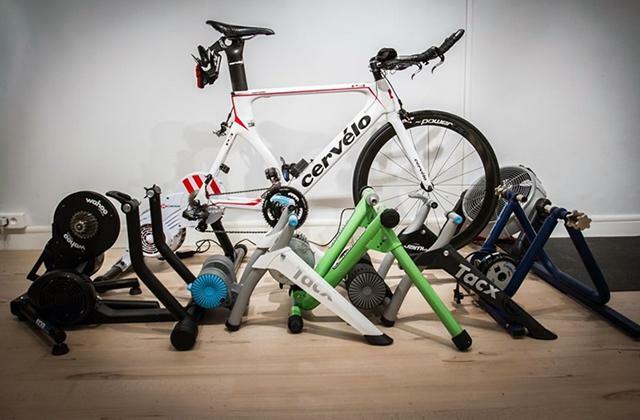 But not all of these bikes are created equal, with some being clearly better than the others. So, if you'd like to become the coolest kid on the block, you're going to need a wicked BMX that will match your freestyle skills, open the possibility for performing some of the coolest stunts imaginable, and allow you to become a trendsetter that will redefine the rule of cool as far as your neighbourhood is concerned. While these requirements may seem overly strict for the majority of models out there, the Mafiabikes Kush 2 20" is the kind of extreme sports vehicle that can simply scoff at these demands since they aren't even remotely enough to challenge the undisputed king of BMX bikes. Though the original iteration of this model has been on the market for quite some time already, the Kush 2 is still one of the best-selling bikes in the UK today, with over 50 thousand models making it to the streets over the past few years. Pointing out everything that makes this bike one of the absolute bestsellers on the BMX market would be next to impossible given that there are way too many pieces to this brilliant puzzle, but we will try our best to bring to your attention some of the things that we believe to be of the utmost importance when it comes to this product's commercial success. Any bike starts with a frame and the Kush 2 is no exception to this rule. 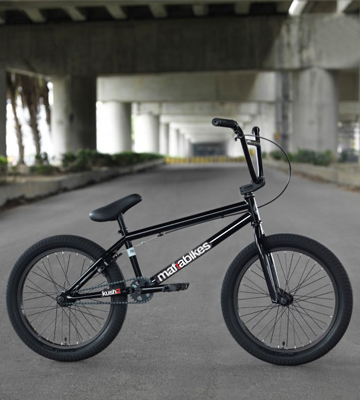 The model is equipped with a 20'4-inch high-tensile (carbon) steel frame, which, as most BMX enthusiasts are probably aware of, is an exceptionally strong and durable steel. Generally speaking, the only downside to this material is that it tends to increase the weight of the bike, but that isn't the case with the Kush 2 thanks to the brilliant design that does not incorporate any unnecessary junk, making the model surprisingly light. The list of unnecessary junk, of course, does not include a U-brake with soft clear anti-scuff pads that will allow you to tackle any obstacle knowing that the rear brake is always going to be there whenever you need it. Speaking of the rear, the model also features an alloy single wall front rim and a double wall rear rim that will firmly secure the position of tyres and the tube in place. The massive 2.4" lagos crawler tyres were designed to carve really clean and absorb heavy impact, so you can ride as fast as you want without compromising your grip. Now that we finally mentioned grips, we would be remiss not to talk about the aftermarket Hitmain grips. With these bad boys positioned at each end of the 74-centimetre wide handlebar, your hands will be practically sealed to it for as long as you want. Along with the plastic VM slim pedals, you will be able to handle some of the steepest terrains as well as shred any skatepark with comfort and grace. The last thing worth pointing out is the KMC chain made of stainless steel with a titanium nitride coating. As you would imagine, a chain like that is there so you won't ever have to worry about this thing failing you when you need it most. All in all, the Mafiabikes Kush 2 20" is still technically an entry-level model, but given the kind of specifications it comes fitted with, the product could definitely be described as one of the best BMX bikes for experienced enthusiasts looking for an affordable yet reliable freestyle option. 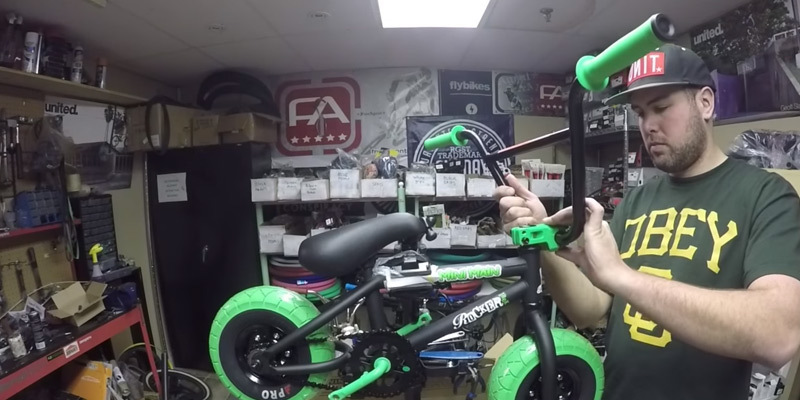 While we are certainly eager to talk about this incredibly fun and impressive BMX, there's something we'll have to get off our chest first: this Rocker BMX mini bike has no brakes. On top of that, you cannot even order them separately and install the brakes on your own. The model has been designed exclusively for off-road racing on enclosed tracks. The people behind this product do not offer a road kit for this bike since it should never be used on the road and any future owner should always stick to off-road riding. Now, with that out of the way, we can finally talk about all of the things that make this bike so much fun to ride. 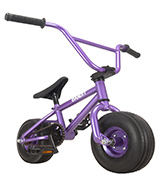 As we have previously mentioned, what we have here is the Rocker mini BMX bike. If you're not familiar with the brand, Rocker is a British company that essentially started the mini BMX revolution and continues to develop and innovate the sport at the top level. To put it bluntly, these models are basically chunky mini versions of 20" BMX bikes specifically designed to take a serious amount of adult-sized abuse. Featuring bulky tyres, huge bars, and top load stems, these bikes can be every bit as rad as 20" ones as far as off-road riding goes, but also offer additional capabilities in terms of tricks and stunts. The model in question is the best compromise of affordability, performance and quality for those who would be absolutely thrilled to purchase a mini BMX bike but can't afford some ridiculously overpriced solution from one of the more renowned brands. It doesn't really take a DIY savant to assemble, so you can start learning new tricks in mere moments after the long-awaited package arrives at your doorstep. Since what we have here is a mini BMX, some people might assume that it'd be more fragile compared to the regular 20-incher. Well, that is where these individuals are wrong. Despite its size, this is one of the more durable models out there. The biggest driving force behind this durability is the high-tensile steel frame, forks, and bars. The majority of mini bikes tend to be comprised of aluminium since it is much lighter and, thus, easier to use in a mini version, but the manufacturers were able to utilise carbon without compromising the weight and the modest dimensions of this model. On top of that, the front load stem includes a forged faceplate using a new freewheel system, so you can rest assured knowing your handlebar and your steer tube are safe and secure. 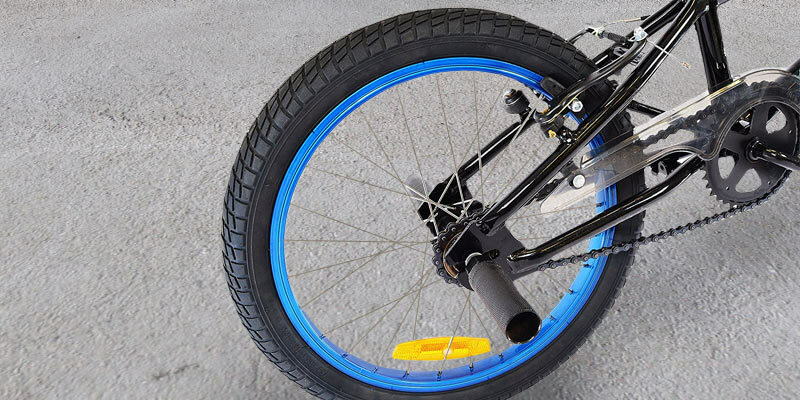 The said two-piece steel freewheel will allow you to have a complete control of this vehicle using a pair of plastic pedals with matching Kraton rubber grips. The new and reduced fork clearance will prove to be immensely helpful in terms of pulling off easier foot jams, an angled seat clamp is comfortable enough for you to perform some of the craziest stunts you can think of, and the micro dropouts are there in order to provide that super clean-looking back end. Suffice it to say, the Rocker BMX iROK+ MINI MAIN Rocker is definitely not a bike for everybody, but if you're the kind of person that always looks for new experiences and unique solutions to orthodox grinding problems, this is a model worth looking for. A good session is all about freestyle riding and performing some of the sickest tricks and stunts that could leave the viewers speechless. And in order to do that, you're going to need a BMX bike capable of handling that kind of workload. But any BMX enthusiast will tell you that while the specifications of the bike are very important, BMX riding is just as much about looking cool as it is about technique and performance. Therefore, in order to become the real king of the skatepark, you will need a vehicle that doesn't just deliver in terms of technical characteristics but also oozes coolness out of every possible part. And if you feel like that is too much to ask from an entry-level BMX bike, wait until you see the Flite Punisher FL020. 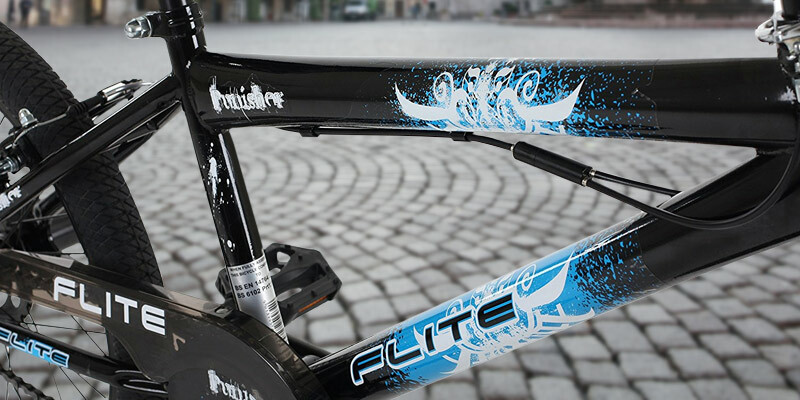 People behind Flite aren't really new to the world of BMX racing and their bikes have been known to be a blueprint of style and function that always deliver a unique touch of charisma, with each model being carefully designed in order to fulfil every single whim of their customers. Aside from impressive specifications and outstanding design solutions that we are going to cover in a moment, the company always makes sure not to oversell their products so that their often young customers will be able to keep up with the latest trends without drilling a substantial hole in their parents' pockets. To say that this BMX bike looks daring and mighty impressive would be quite an understatement, to say the least. An electric blue, black, and white-themed frame effortlessly stands out in a crowd, making sure that everyone sees what you're capable of. 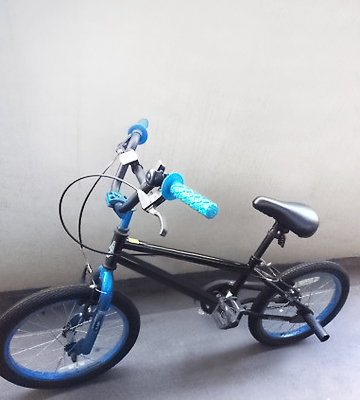 However, as far as black BMX bikes go, this one will also be able to blend in during the night, so that you can easily go on a grinding mission without having to worry about security guards spoiling your fun. 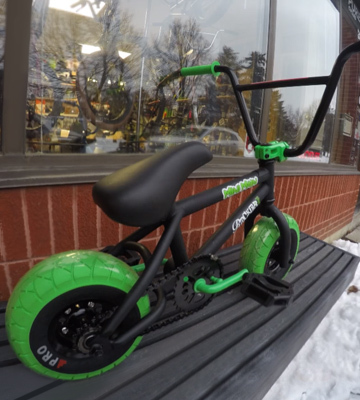 The frame itself is 11 inches in size, making it perfect for riders under the age of 15. As you would expect, the model does not disappoint in terms of comfort and performance either. The padded saddle has been specifically designed to secure maximum comfort in order to provide the rider with an additional boost of confidence that will come in handy whenever one might try to perform a trick off a solid jump or a simple bunnyhop. An exceptional rotor system will allow you to keep your cables untangled. Thanks to this system, along with 20-inch black alloy rims with large flange steel hubs, spinning your handlebar around 360 degrees has never been easier, so your tailwhips will always come all the way around. Furthermore, the solid steel rear stunt pegs will open the possibility of grinding with style and power. With a 40 x 18 gear ratio, this bike features a considerable amount of push-per-pedal revolution, providing the user with the opportunity to achieve reasonable speed in no time. And if you ever see an Alligator Pit in front of you, there's no need to fret since you will always be able to rely on alloy V-shaped brake levers located both on the front and in the rear. So, if you feel like an incredibly daring and stylish BMX bike that'll allow you to perform some of the sickest possible stunts would be right up your alley, you should definitely consider looking towards the Flite FL020. If you hear your little bandit throw around terms like drivetrain, Wood-Pusher, and quarter-pipe, there's a good chance it is high time for you to purchase one of the countless BMX bikes for kids. Sure, you might think that BMX riding isn't really one of the safest pastime activities out there, but good luck explaining that to your kid who is already invested in the BMX subculture and will unlikely take no for an answer. Of course, you can always try to argue that you know better, but instead of bumping heads with your future rider, you might want to consider acquiring a bike that will allow your kid to safely explore the exciting world of BMX riding. With that in mind, we can wholeheartedly recommend taking a closer look at the RayGar 2017 Bandit Purple Mini. First things first, before diving deeper into some of the more technical specifications, we would like to point out that the model in question is incredibly easy to assemble. All you have to do is take the whole thing out of the box, straighten and tighten the bars, and put the seat on. Your kid should be able to move the bike from the box to backflips in no more than 5 minutes himself, but, naturally, you can always lend your BMX enthusiast a helping hand if he manages to run into some kind of obstacle. 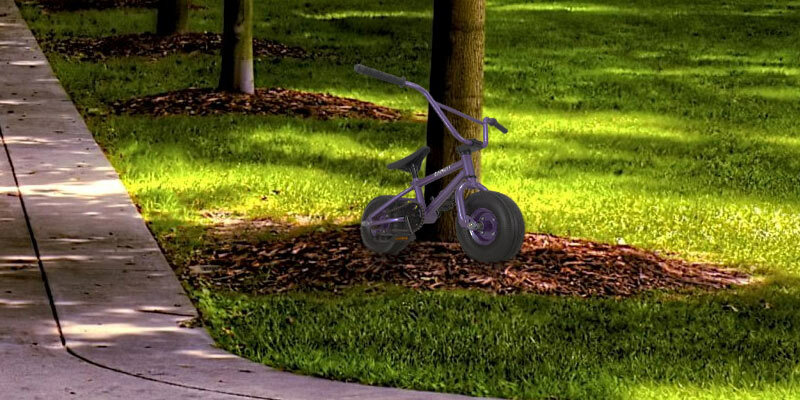 By the way, as you'd probably infer from the bright purple colour, the device is suitable for children ages 5 and up, but that doesn't mean that an adult can't use this mini BMX bike to dust off some of the old moves and remember the good old days when you could shred the pipes yourself. Kids aren't particularly known to be gentle with their bikes, always trying to push these things to their absolute limit, which is exactly why it is so important that this model, unlike the majority of mini BMX bikes out there, does not incorporate aluminium in its structure and relies solely on a high-tensile steel frame to do most of the heavy lifting. The aforementioned material doesn't just make this vehicle incredibly robust but also gives it the required weight at approximately 12 kilograms. But that's not all there is to it in terms of protection since the model also incorporates a top load stem that lends it more strength and gives the bike a better ride. On top of that, a padded PVC seat will provide just enough comfort to successfully pull of some of the coolest tricks. Aside from the frame, the bottom bracket, bars, and pedals are also comprised of top grade materials, so the mini BMX bike in question will be able to handle a serious amount of abuse. Last but not least, the model comes equipped with 10" steel wheels and 10" heavy duty, high impact, chunky, rubber tyres, so no terrain will be able to throw your rider off his game. 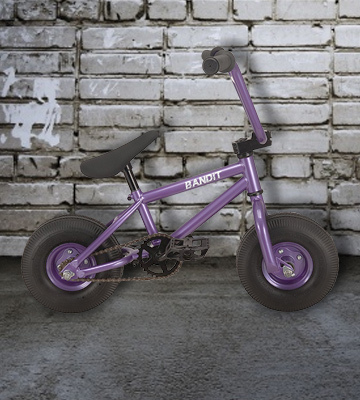 In conclusion, the RayGar 2017 Bandit Purple Mini is something that you simply cannot afford to miss if your kid is ready to challenge some pipes or handrails and all he needs is a reliable vehicle that could handle a substantial amount of abuse. Despite the fact that BMX riding has been around for decades now and the entire subculture has been experiencing nothing but growth for the past 35 years ever since the BMX craze took off in the UK somewhere in the early 1980s, plenty of people never did properly manage to give this extremely fun activity a whirl. Some have simply grown out of it and decided that it's too late for them to try, while the newer generation just started to reach the proper BMX age and aren't necessarily familiar with all of the possibilities that a proper motocross bike can offer them. Well, fortunately enough, the SilverFox BMX Plank 18" is here to remind you that it is never too late to start enjoying some casual BMX riding yourself or get your kid acquainted with this incredibly fun hobby. 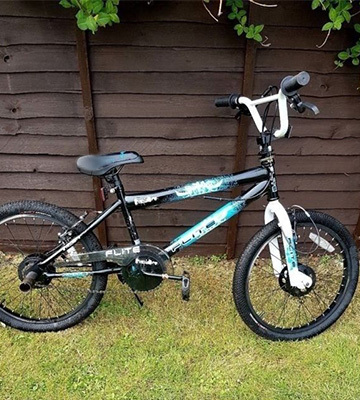 As you have probably guessed, this is a BMX bike that was designed mostly for kids in the age range from 7 to 10 years old, but with a leg size of 16-20", 18-inch wheel and forks, and 18" tyres with 1.95 freestyle tread, any adult will be able to use this model to pull off some sick moves in the local skatepark. Of course, if you're planning to use this product for racing, a 9" frame size would suggest that this isn't the best option for adults as far as light BMX bikes go. As the model weighs no more than 11 kilograms, it will be perfect both for girls and for boys to practice for the upcoming X-Games or for the BMX World Championship. Although what we have here is one of the cheaper options on the BMX market, SilverFox did not design the model so it would trail behind others in terms of specifications, incorporating a variety of modern solutions that you would be hard-pressed to find in other BMX bikes in this price range. The previously mentioned frame is a BMX style that includes pivots for V-brakes. The brakes are located around each of the wheels using an adjustable two-finger system in order to secure the safety of the rider. Thanks to the BMX freestyle handlebar and freestyle tyres, the Silverfox Plank will be able to deliver exceptional performance. The bottom bracket is a one-piece BMX type as well, so your crankset will be able to rotate freely without stiffening your movements. And, as you would expect, both the handlebar and the bottom bracket are made of steel as well, so you won't have to worry about damaging your bike in the process. 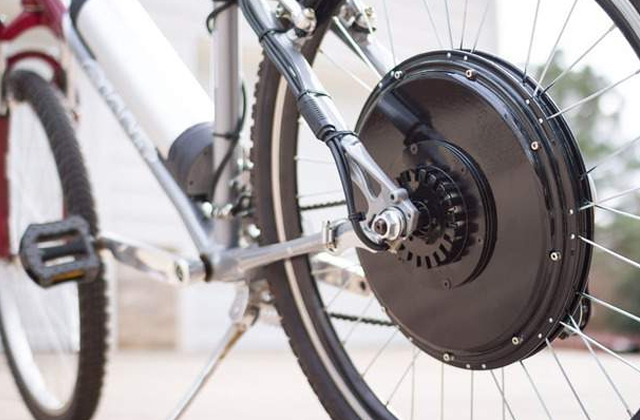 The gear is a single speed type, meaning that this product is a fixed-gear bicycle that has a drivetrain with no freewheel mechanism, so the pedals are directly coupled to the wheel. The only real downside to this model is that assembling it might take some time given that the manual is somewhat confusing, but, other than that, the SilverFox BMX Plank 18" will be a perfect choice for beginners that want to explore the world of tricks, stunts, and BMX racing but don't quite know where to start. What Is a BMX Bike? There are plenty of different types of bikes out here, but if we had to choose the most remarkable one, it would have to be BMX. BMX bikes are designed for extreme riding, most often used on streets and in skate parks. 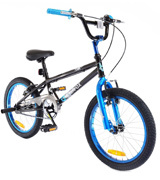 BMX bikes are much more durable than ordinary bikes, they are very small and light to perform tricks, jumps, and stunts. 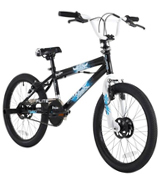 BMX bikes are extremely popular with riders of all ages. 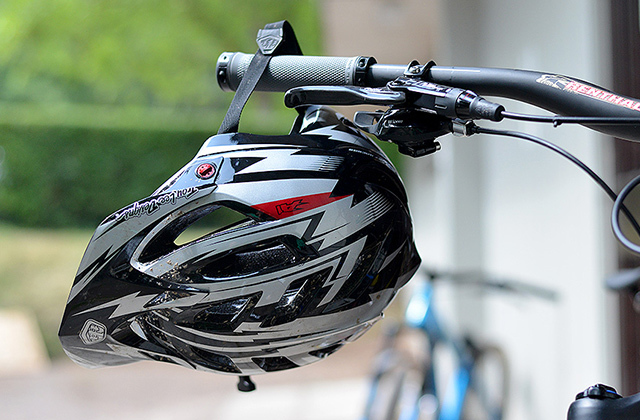 We also recommend you to get a bike helmet to protect your head in case of falls and a bike cover to protect your bike when the weather is unfavourable. The first thing you should pay attention to is the bike dimensions. Remember that the taller the rider is, the longer the frame should be. 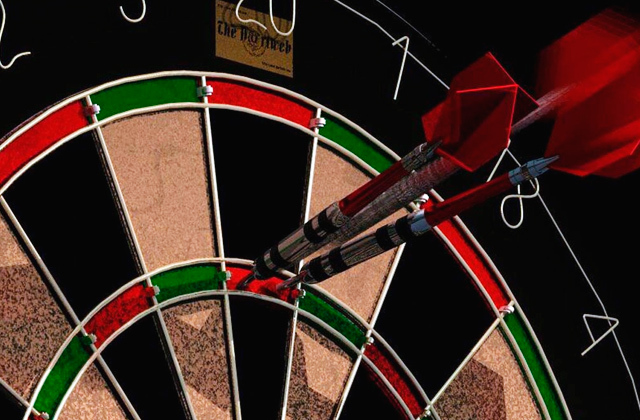 The frame can be made of Hi-Ten steel or different alloys. The bikes with alloy frames are very strong and durable, but the price and the weight of such bikes are also "heavier". The wheel size depends on the frame size and your riding style. The handlebar should match the size of your shoulders. 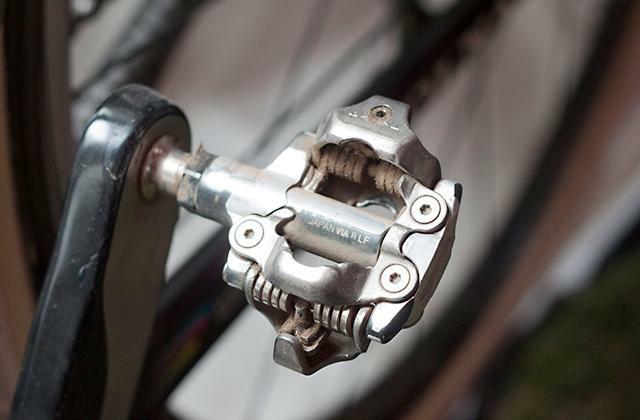 There are several types of crank systems, and the most common are three-piece and one-piece cranks. A three-piece crank allows you to replace any mechanical part whenever you need it, but such systems are much heavier than one-piece cranks. The length of the crank should also be chosen according to a cyclist's height. 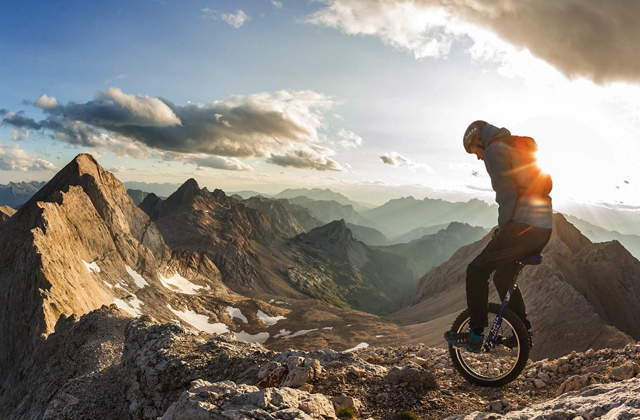 Brakes certainly make riding safer, but in extreme riding, too many cables can cause discomfort while doing tricks. Thus, a bike with a gyro brake system is a preferable option for any rider. Thanks to the gyro system, the cables won't tangle and you will be able to do tricks with the handlebar turning around. The BMX bikes can be equipped with pegs for tackling ramps and street obstacles. 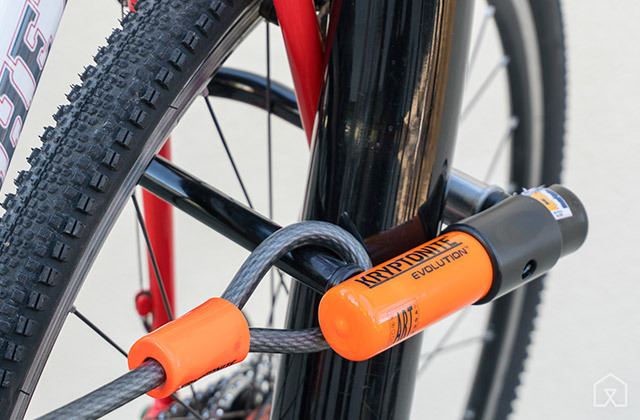 The chain cover won't leave a chance for your bike to wind your pants. Plus, if the bike is fitted with reflectors, you will be more visible on the road. Without a doubt, protecting your skin is the most fundamental and important rule to follow when it comes to BMX riding, regardless whether you're looking to do some rad tricks or simply ride around the neighbourhood. If you don't have your skin covered, even seemingly the mildest falls can leave you with second-degree burns, especially if you fall on the asphalt. So make sure to put on your trousers, a long-sleeved shirt, some gloves, a pair of comfortable shoes, and a full-face helmet. The racing pants should preferably be made from lightweight nylon or sail cloth materials since those are generally much more difficult to tear. The knee and hip areas should be padded. Naturally, if you're currently short on cash, a pair of jeans or jogging pants will suffice, but those do not offer the same level of protection, so make sure to acquire proper safety gear whenever you have the chance. Sure, you may look slightly less cool with all of these pieces of protective gear on you, but it beats getting injured ten times out of ten. 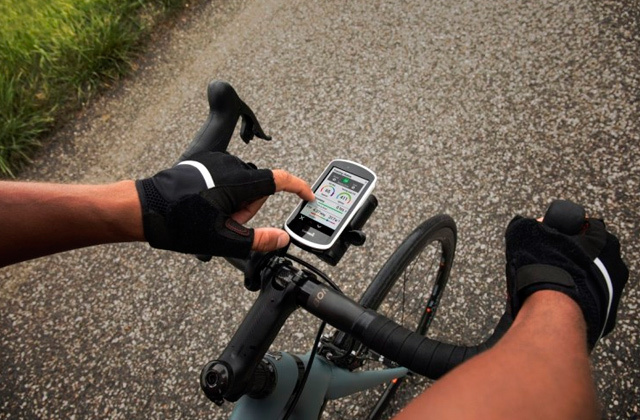 While all of the protective gear is obviously important, at the end of the day, your bike is the tool that will be doing most of the heavy lifting, so you'll have to make sure that everything is in order before ever setting foot on the road. First off, you have to make sure that a frame and the forks are all the right size and in good condition, not distorted, cracked, or broken. The wheels shouldn't be larger than 53.3millimetres in diameter and the handlebars mustn't be wider than 735mm (that is, of course, if you're using a standard 20" BMX). An axle should never extend more than 6mm beyond the axle nut and the brake should always be able to lock the back wheel. Make sure that your tyres are properly inflated and do not include any splits or separations. Finally, you should verify whether the chain and the bearings are oiled or greased and properly tensioned. This should obviously go without saying, but plenty of people still believe that they're better than that and the rules do not apply to them. Regardless of how skilled you are, whether you're participating in BMX racing or simply having some fun with your friends at your local skatepark, you should always follow the rules and respect the guidelines and regulations that are inevitably going to be there. At the end of the day, even if you're objectively an expert as far as BMX riding is concerned, there will always be plenty of people around that aren't as good and you'll have to make sure that you are never close to inadvertently endangering one of them. Q: It seems like there are quite a few different types of BMX bikes. What is the difference between them? A: While people generally tend to group up a bunch of different vehicles together under the “BMX” name, it is important to understand the difference between all of these bicycles. 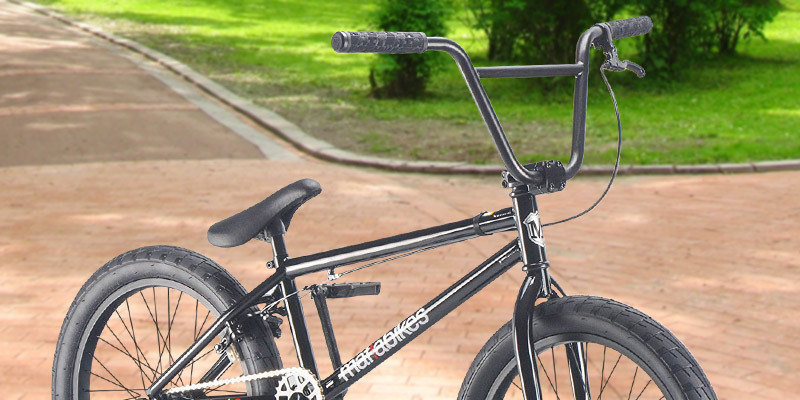 When it comes to the regular “20-inchers”, there are three distinct types of BMX bikes. The first one is a classic BMX that was originally created as a light and agile racing bike. 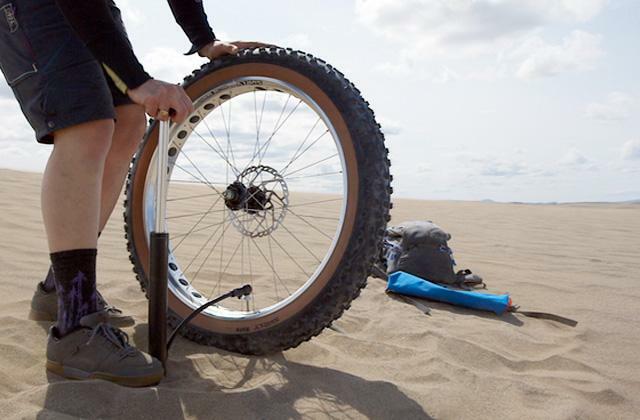 These vehicles tend to be rather thin, normally incorporating low-profile tires with a slightly knobby to slick tread pattern, a steeper head tube, and a strong rear V-brake. The latter is important since these bikes were designed for racing on specific BMX tracks that often feature some of the more challenging terrains. Then there are the so-called street or park bikes. 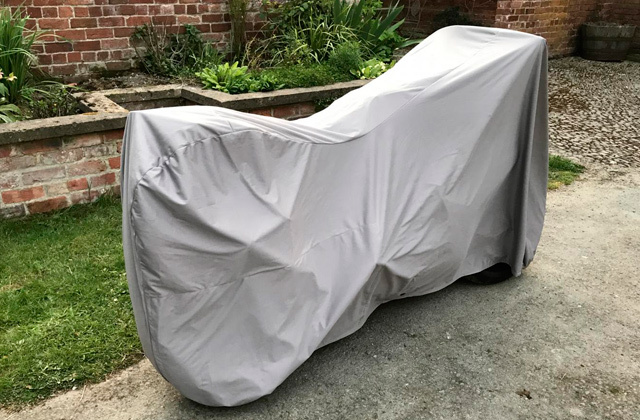 You will be able to recognise them by a knobby to low-profile tread pattern with a wider tire, a rear U-brake or an entirely brakeless structure, pegs, and a cable detangler. 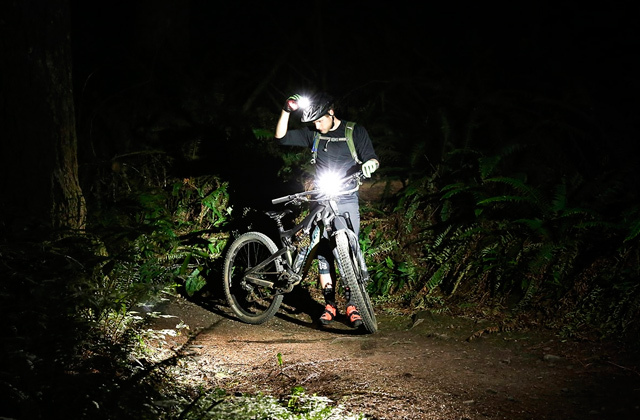 Essentially, these bikes are durable and versatile rigs that can handle crashes and rough riding better than any bike out there. And, given the aforementioned description, it should come as no surprise that these bikes were created with a singular purpose in mind. If you’re interested in a vehicle that would allow you to do some dirt jumping, street and park riding, tricks, and grinding, you should definitely look for a model of this type. The last member of this 20-inch BMX family is the flatland type. 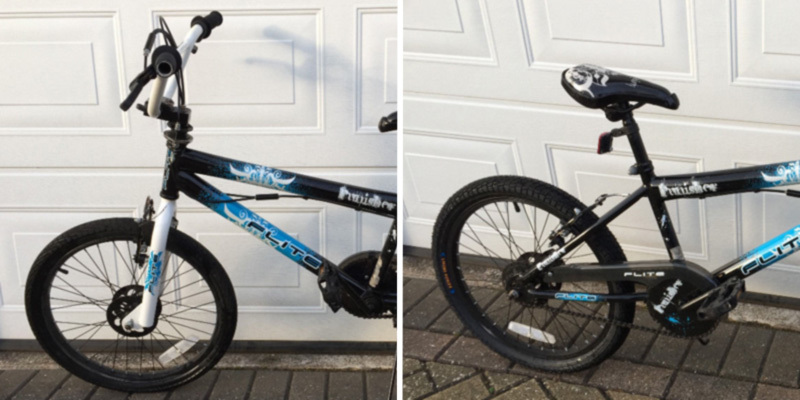 You will easily be able to tell these BMX bikes apart from the other ones by paying attention to the smaller frame and a wheelbase, a longer seatpost, and a zero-offset fork. Thanks to the previously mentioned small frame geometry and a few additional specifications, these bikes will be perfect for flatland trick riding. Now, although technically not a BMX bike, you might also run into cruisers. 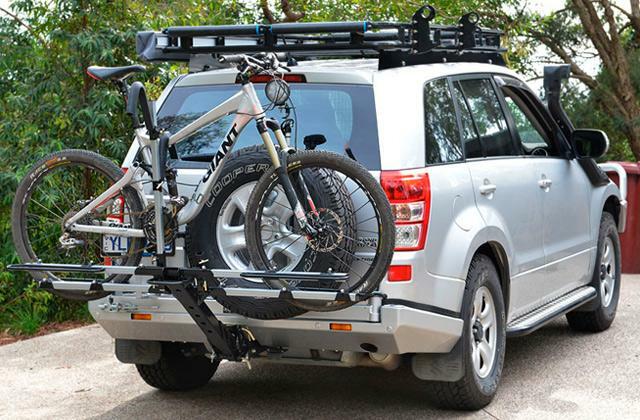 The biggest distinctive feature of these vehicles is a larger frame that accommodates 24-inch wheels. Thanks to such increase in size, this is, by all means, a more forgiving race bike that is also good for tall, large riders and dirt jumping. Q: What is the difference between a regular 20-inch BMX bike and a mini BMX bike? A: As you might have guessed, the biggest difference between these two kinds of bikes is the size. 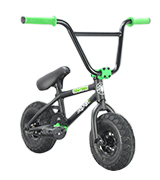 The majority of mini BMX bikes are targeted towards children no older than seven, so they generally feature low stand-over height, 130- to 145-mm cranks, and 20 x 1 1/8-inch tires. Q: What is a Quarter-pipe? A: A quarter-pipe is essentially a ramp that looks similar to a quarter cross-section of a complete cylinder, usually consisting of a transition, lip, deck, and coping. Q: What Is an Alligator Pit? A: An Alligator Pit is a slang term used to describe a particularly challenging gap that could potentially pose a serious threat to the rider if not done properly. Q: What does BMX stand for? A: BMX is simply an acronym for Bicycle Motocross that was coined in the early 1970s. 1. BMX Bikes, The Bicycle Club. 2. BMX bike, Wikipedia. October 23, 2016. 3. BMX, Pedal Power Association. 4. Ric McLaughlin What is BMX? BikeRadar. September 15, 2012. 5. What Is a BMX Bike? eBay. June 29, 2014. 6. BMX Racing Bikes vs. BMX Trick Bikes – What Is The Best Choice? For the Love of Bikes. 7. Freestyle BMX, Wikipedia. November 1, 2016. 8. Owen H.L.Davies Facts About BMX Biking, LIVESTRONG.COM. August 20, 2013. 9. Charles Webb The History of Street BMX, LIVESTRONG.COM. July 15, 2015.